China’s gas supply deficit continues to rise. It is being propelled by booming demand and slowing domestic gas production increases (the deficit was 45% of demand as of June 2014). Now looming on the horizon: a future of much greater Chinese gas import volumes. Pipelines from Central Asia, Myanmar, and perhaps Russia, as well as LNG terminals, will bring gas supplies into the Middle Kingdom. Once the gas enters China, internal trunk pipelines represent the primary mode of moving molecules to market. Thus far, China’s trunk gas pipelines clearly flow to the parts of the country with the most intense nighttime light emissions. After all, light emissions are a strong proxy for aggregate economic activity and energy consumption (Exhibit 1). *Data from May 2013. Additional construction has occurred since, but this dataset gives an accurate macro overview of areas served by large, trunk gas pipelines in China. One key takeaway from Exhibit 1 is that there are densely populated areas of North and Central China with increasingly intense economic activity and energy consumption, yet they are either completely unserved or partially underserved by gas pipelines. For gas use to really take off in these areas—as must happen for China to meet its new pledge to make natural gas 10% of total energy supply by 2020—high-volume gas supply infrastructure must be built. The bottom line: future gas trunk pipeline construction in China is likely to mirror the country’s rail corridors. 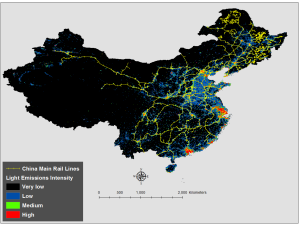 China’s existing trunk gas network already closely correlates location-wise with the country’s primary rail lines. This trend will likely continue. The reasons for the close relationship are straightforward: (1) both railways and pipelines link demand and supply centers for the resource/service being provided, (2) rail and gas supply services both typically prioritize locations with the highest economic activity, and (3) railway and pipeline builders tend to favor the most topographically sensible (flattest) path between locations to minimize cost and construction time (Exhibit 2). Using rail lines as a proxy for future gas supply corridors strongly suggests that many parts of the North China Plain and Central China, in particular, remain significantly under-serviced. These locations, along with Guangdong Province, will be key areas of natural gas trunk pipeline construction activity over the next decade as China moves to clean up urban air by boosting natural gas consumption. Large areas of Qinghai and Tibet, by contrast, will likely remain peripheral in terms of geography, economics, and gas grid infrastructure. While radically improving Chinese air quality will be difficult, projecting China’s overall gas pipeline buildout is not: existing lights and railroads will point much of the way.